Mmmmm…nothing says summer like ice-cold lemonade. 😋 But the usual store-bought lemonade is loaded with sugar, so we have a better idea. 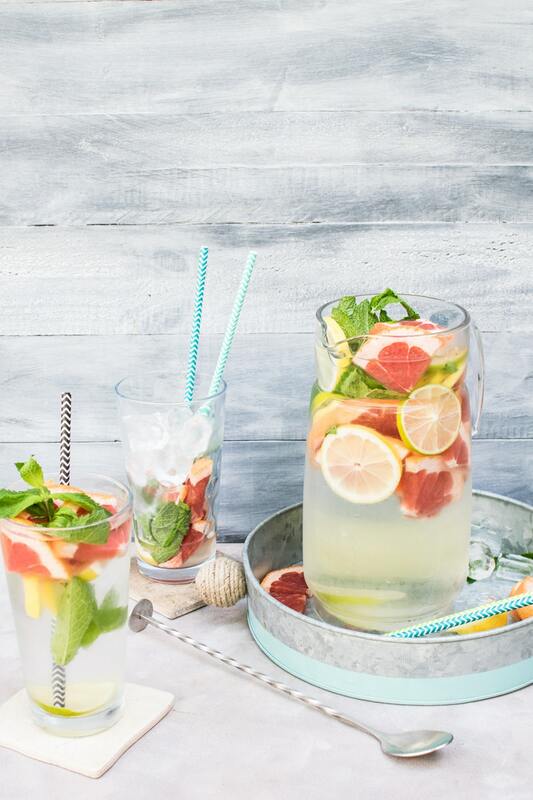 Fruit-infused water helps you stay hydrated, and it’s delicious! Check out our favorite essential oil recipes inspired by Wellness Mama for ideas. Add 1 cup raspberries, 1 cup blueberries, 2 kiwi (peeled & sliced), and 8 mint sprigs to 8 cups of water. Refrigerate for at least 3 hours. Stir well and strain, then top with some fresh fruit if desired. Peel and thinly slice about 1/4 of a pineapple. The thinner the slices, the more flavor it’ll give ya. Add pineapple to a glass jar with 10-12 leaves of muddled fresh mint. Fill with water and stir gently. Store in refrigerator. Add two cups of fresh cherries, cut in half, and one fresh lime, sliced into thin slices. Combine with water in a gallon-sized glass jar. Mix gently and store in refrigerator until ready to drink. Add one grapefruit, thinly sliced with the rind still on, to a gallon-size glass jar. Then add ½ cup fresh raspberries. Add water and mix well. Store in refrigerator for at least 4 hours before drinking. Peel and thinly slice one fresh mango. Add to ½ gallon glass jar. Add 1 cup of finely-chopped pineapple and filtered water. Allow to infuse in the refrigerator for 4-6 hours before drinking. The hands-down kid favorite at our house. Place 2 cups of halved organic grapes into a gallon-size glass jar. Add one orange, thinly sliced with the rind still on. Refrigerate overnight for best flavor. Add about 2 cups of finely chopped watermelon (without the rind) to a large glass jar. Add 15 leaves of muddled basil and fill the container with water. Store in refrigerator and allow at least 4 hours to infuse. It’s got the refreshing taste of strawberry lemonade without all the sugar! Just add 15 fresh strawberries, washed and finely sliced, to a glass jar. Add one sliced lemon with the rind still on. Fill with water. Stir gently and refrigerate 4 hours or overnight.